The Turnpike Troubadours, whose name is derived from the bumpy Oklahoma toll-roads and their hard lived folk singing heroes, are proof that isolation can be the mother of originality. Cutting its teeth in roadside dancehalls and honky-tonks has made a serious impact on the band’s musical style, which walks the proverbial line between Woody Guthrie and Waylon Jennings. “Bossier City,” the band’s debut album, is a testament to the small towns in which they were raised. It combines Folk, Country, Cajun, and Bluegrass with stories of longing, humor, tragedy, and overall life in rural America. Their live show reflects years of coercing beer joint crowds into responding to unfamiliar music. It is fast, gritty, and often drenched in beer, but always a good time. 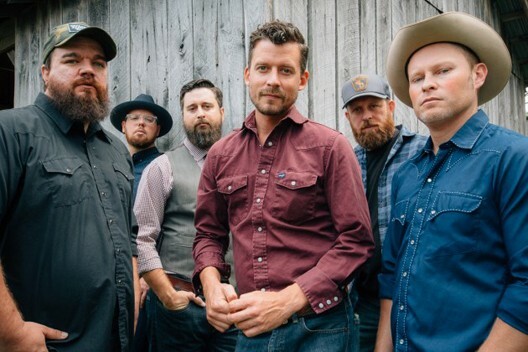 The Turnpike Troubadours continually gather ground both literally and figuratively as they share the stage with many prestigious acts in all genres. Currently the band is working on its follow up album with veteran producer and songwriter Mike McClure as well as relentlessly playing shows in Texas and Oklahoma. Excellent album from beginning to end. Hope these guys never stray away from that Turnpike Troubadour sound. It all original. Nobody out there like these guys. Well Done! Why can't we get these fellers to book somewhere nearer the Kansas border? ANY KS border! Amazing! From "Gin, Smoke, Lies" all the way to "Quite While I'm Ahead"; you'll listen to it over & over. Recently saw these guys at a sold-out show at the Cain's ballroom in Tulsa. I've known them from the start and they just keep gettin' better and better every time i see 'em! I don't think it will be a very long time at all until they're known coast to coast, if that's what they want. You HAVE to see these guys LIVE. What a show!! These guys are the real deal, just a breath away from hitting the big time. Their cd is incredible, but live is ten times more over the top! One live show will result in their cd permanently playing on your radio or i-pod!!! They are truly addictive! The Turnpike Troubadours are the real deal. Diamonds & Gasoline is a great CD and is well worth the money. They also deliver an outstanding live show. Have seen them a few times in the last year and can't wait to see them again.